With an army of percussive instruments, powerful vocalists and guitarists, Los Patos Poderosos play with a celebratory vigor as they bridge Latin and American music. Los Patos Poderosos, Spanish for “The Mighty Ducks,” is a Latin music group made up of UNT students, alumni and faculty. The group has performed in Dallas and Fort Worth, but largely plays in Denton. The band’s roster consists of three vocalists, two guitarists, an electric bassist, two percussionists and a keyboardist. Typically, however, the band only plays with one or two members from each section at a time, depending on which members are available to play a show. Currently, the band is comprised of teaching fellow Laura Otero, Mafe Naranjo, and Monica Gastelumendi on vocals; Chris Hokamp and Ronin Delisle on guitar; Jesse Coulter on bass; and Joe Cripps and Andrew Scott on percussion. The style the band plays is rooted in the Latin cumbia style, which prominently features a specific rhythmic pattern of two short notes followed by a long one, bassist Coulter said. More specifically, the band plays what is called Peruvian cumbia, or chicha music. Chicha, a subgenre of the cumbia style, combines elements of Latin music with the influences of 1960s psychedelic rock. The genre was born in Peru in the ‘60s, and Coulter said the fusing of the two musical styles makes for a more approachable style of Latin music. Coulter said he and another founding member, Chris Hokamp, were attending UNT when they discovered chicha music. In his experience with the band since its forming in fall 2012, Coulter said playing with the group has been fulfilling because of the people he’s played with and the opportunity to work with the university. In the different environments they’ve played, Coulter said audiences have been very receptive to what they present. 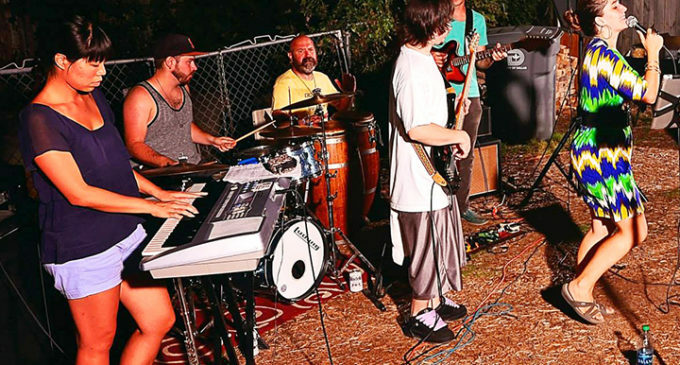 About two weeks ago, the band played in Dallas at The Wild Detectives, a bookstore and coffee shop, for the store’s “Chicha Night,” which celebrated Latin culture with music and food. One of the owners, Javier Garcia del Moral, said the band was a perfect fit for capturing the spirit of the event. Moral said the band made sure that regardless of whether or not people were familiar with the chicha genre, they would become fans by the end of the night. It proved effective. Moral said the band played three encores per the request of the audience. The band was set up with Moral through the Chasquis group, a Dallas-based multicultural production company headed by Victor Rimach. Rimach discovered the group while he was in Peru after a musician told him about a chicha band from Denton. Particularly, Rimach said the main vocalist, Laura Otero, was classically trained and has a commanding stage presence. He said the band does an incredible job presenting a genre that is relatively unknown in America. “Chicha music has been a very strong force in the reinvention of contemporary popular music in Peru,” he said. Rimach said the genre is flourishing in the Dallas-Fort Worth area, citing diversity and the Hispanic population as key factors in its success. In recognizing their work and enthusiasm, Moral said the band’s celebration of culture and exceptional talent was reflected in their performance, and that he has a huge amount of respect for what the group is doing.